Motorcyclists know that riding gives them a freedom that driving a car just can’t match. Riders also know that motorcycles don’t provide the same protections that cars do in the event of a crash. The best riders take great care in all situations, whether they’re in heavy traffic, stuck in the rain or just taking a short ride on a sunny day. If your habits aren’t as safe as they could be, or if you’re new to motorcycling, don’t worry! These quick safety tips below are great to start implementing. Wear proper riding gear. Most importantly- wear a helmet, no matter how short your trip may be. Make sure you can be seen by other motorists. Make it easier for them by wearing reflective clothing, always using turn signals along with hand signals, and keeping your headlight on. Even when taking the above precautions, stay alert and assume that other drivers don’t see you, especially at intersections and when making lane changes or passing. Again, make sure you’re visible, particularly at dusk. Consider upgrading your headlight or adding other lights to your ride. Is your bike black? What about your clothing? Both will make you more difficult to see at night. Your vision needs to be clear, so keep your visor or goggles clean and free from scratches. Carry a flashlight or other emergency gear with you so a mechanical problem doesn’t leave you stranded and hard to see on the side of a dark road. Keep rain and cold-weather gear handy. Riding isn’t just more enjoyable when you’re warm and dry, it’s safer, too. It sure would be nice if all of your rides could be on sunny days with wide-open roads, but we know that isn’t always going to happen. 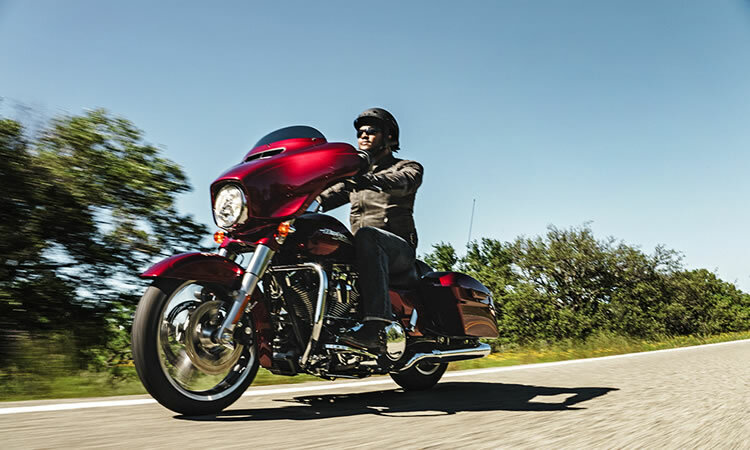 Make safety a priority and your next ride will be one to remember.